Labour tweeters and bloggers have said the coalition government’s Budget was regressive and a terrible thing for the country since before Osborne even finished reading it out. But now the Institute for Fiscal Studies, independent arbiter of all things financial and economic, have agreed. Clearly regressive, [hitting] poorest families and households more than those in the upper-middle of the income distribution in cash, let alone percentage, terms. Low-income households of working age lose the most as a proportion of their income from the tax and benefit reforms announced in the emergency Budget. 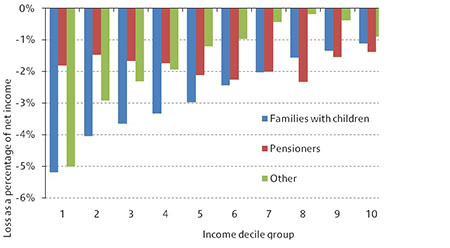 The graph below shows up very clearly the myth of Osborne’s progressive Budget, with the poorest losing out most and the wealthiest, the least. 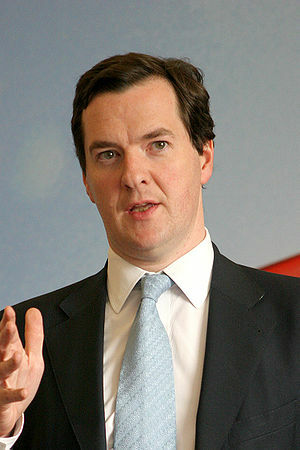 The results of this IFS research do not include the coalition cuts, now thought to equate to an average annual cut in public spending on the poorest tenth of households of £1,344, equal to 20.5 per cent of their household income, where the average annual cut in public spending on the richest tenth of households will be £1,135, equal to just 1.6 per cent of their household income. The very suggestion that a Budget that includes cuts on this scale can possibly be progressive is a total and utter fallacy which shows the Tory-led government are either callous liars or economic morons. Either way, they’re not fit to run the country. I found Clegg’s response to be incredibly disingenuous even for the Coalition. Seemed to be saying that because they plan to being some people out of poverty (I shan’t hold my breath) via their welfare reforms…. Now perhaps I am being a little dim here, but that surely won’t change the regressive nature of this budget will it? Unless they realistically expect that everyone in the bottom 30-40% incomes is going to magically get loads more household income then even if they do manage to get some more people into work it will still be regressive on those who don’t.